Dr. Horace Thompson received his A.B. degree from the University of Denver in 1944, and his M.D. degree from the University of Colorado School of Medicine in 1948. He interned at Fresno County Hospital, Fresno, California. He was Assistant Resident in Obstetrics and Gynecology at Johns Hopkins Hospital, Baltimore, from 1951-52. He then became Chief Resident in Obstetrics and Gynecology at Presbyterian Hospital in Chicago from 1952-54. 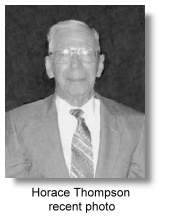 Thompson was on active duty in the military from 1955-57; he served in the National Guard and Reserve for several years. From 1955 to 1956, he operated a private practice in obstetrics and gynecology in Denver. During that time, Thompson started work with Joseph Holmes in the ultrasound laboratory at the University of Colorado Medical Center. When the first contact scanner in the nation was built at the University of Colorado, Thompson used it in obstetrics and gynecology practice. Dr. Kenneth Gottesfeld began assisting Thompson in 1963. Most of the clinical studies coming out of the University of Colorado Medical enter in obstetrics and gynecology is the combined effort of Drs. Stewart Taylor, Thompson, Joseph Holmes, and Kenneth Gottesfeld, using the Physionics® Porta-scan and later on the Picker® Laminograph. Thompson published important work on fetal biometry and placental localization. He introduced the measurement of the thoracic circumference as a parameter for evaluating fetal weight in the fetus. In 1965 his group published results of fetal weight estimation basing on a combination of the biparietal diameter measurement and the thoracic circumference. They reported an accuracy of within 300 grams in 66% of in-utero weight estimates. After Thompson became a full-time member of the Department of Obstetrics and Gynecology at the University of Colorado Medical Center, he was named Chief of OB/GYN at Denver General Hospital. He assumed the presidency of the AIUM from 1978-80 and completed his term of office at the New Orleans meeting, September 1980. Thompson's activities included the chairmanship of the Committee on Medical Instrumentation and Device Standards of the American College of Obstetrics and Gynecology. He was chairman of a similar committee for the Food and Drug Administration. Excerpted in part from the AIUM publication "A History of AIUM" by Dr. Joseph H. Holmes, 1980, updated by Dr. Horace Thompson to 1984. *Picture courtesy of Dr. Eric Blackwell.